Heartworm is caused by a worm, Dirofilaria immitis. Cats become infected with heartworms by a mosquito bite and then it takes 6-7 months for the heartworm to mature. This worm lives in the heart, lungs, and blood vessels of the animal it has infected. Adult heartworms live 2-3 years in the cat and can cause damage to the cat’s heart, lungs, and blood vessels, leading to heart failure, lung disease, and other organ failure. Testing for heartworm infections in cats is much harder to do than in dogs since cats are not the natural host for heartworms. 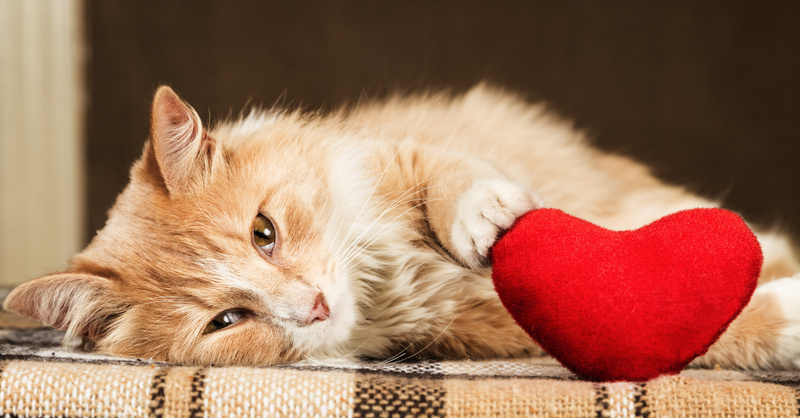 In order to diagnose heartworm in cats, multiple diagnostic tests are routinely used including bloodwork, x-rays, and echocardiography (looking at how the heart functions). Though infections in cats can be light (consisting of just a couple worms), the importance of heartworms is amplified because even a small number of heartworms in a cat can be life threatening. With the cat being an unnatural host for heartworms, the worms frequently move to other tissues of the body. This means we can find heartworms in other parts of the body such as the lungs, abdomen, blood vessels, and central nervous system in cats. When the adult worms live in the lung blood vessels, they can cause a local inflammation of the vessels, but some cats never show signs of illness. If cats do show signs, they are usually non-specific symptoms like wheezing or coughing. Many respiratory diseases of the cat can cause these same symptoms which can be why heartworm disease is overlooked in cats. As the worms live out their lives in the cat and start to die, the worms can cause inflammation of the lungs and become lodged in vessels which can lead to sudden death of the cat. OK, so now that we’ve reviewed heartworm disease in cats, let’s get back to the question original question. Many cats live a more sheltered life than dogs, but unless the home provides an 100% effective barrier to mosquitoes , these “indoor” cats are also be at risk for heartworm infection. In one study of heartworm disease in cats, approximately 25% of cats diagnosed with adult heartworms were considered indoor cats. I’m sure we’ve all see a mosquito that has snuck into our home! 3) Work as a safeguard for missed doses (everyone’s human!). Preventives should be started in kittens at 8 weeks of age and be administered to all cats in heartworm endemic areas. If you have any questions about heartworm disease or if you want to get your pet started on prevention, contact us today. Don’t leave your cats unprotected from this devastating disease! Save time by filling out a new client form before your visit. If you have a question, you don’t have to wait until your visit. Please feel free to contact us anytime.